Eugène Ysaÿe, (1858-1931), is known as one of the greatest violinists, pedagogues, and composers of the 20th century. A student of both Vieuxtemps and Wieniawski, Ysaÿe himself was an influential teacher, with students including William Primrose, Nathan Milstein, and Joseph Gingold, as well as the amateur violinist Queen Elisabeth of Belgium, who later formed the famed Queen Elisabeth Violin Competition in Ysaÿe’s honor. Ysaÿe served as Music Director for the Cincinnati Symphony Orchestra from 1918-1922. While Ysaÿe’s best-known compositions are his set of six Sonatas for Solo Violin, Op. 27, he also composed several chamber works, a solo cello sonata, various concertantes, a Violin Concerto, and an opera. Rêve D’Enfant, Op. 14, was composed in 1894 for violin and piano (transcribed here for cello), and is one of two pieces dedicated to Ysaÿe’s son, Antoine. 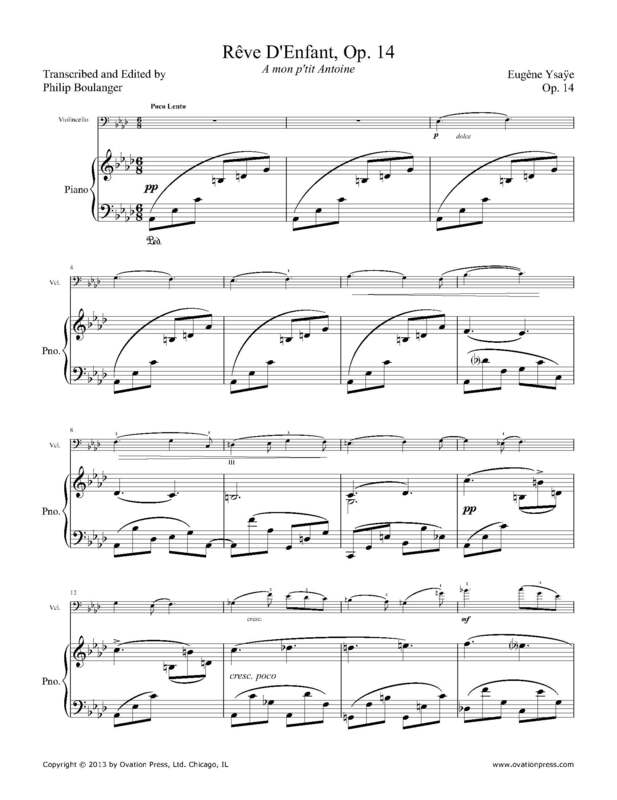 The piece is lyrical and romantic in nature, with a lilting melody that builds in drama and tension only to resolve back to a soothing lullaby over the piano, and would be a lovely addition to any cellist’s repertoire. Click below to listen to a recording of Ysaÿe performing Rêve D’Enfant, Op. 14.